Nintendo DS has been making the news with the DSi, and we’ve reported on a number of new applications for this portable gaming system in the past few years. I’m not certain if this is the first time we reported on a GPS unit for the DS, but this one from Ranger China is the first that I have ever seen. It looks like all you have to do is plug it in to the GBA cartridge slot, and you got yourself a grand Garmin look-alike! The Ranger has the latest GPS chipset, and uses Google Maps software. I believe that the plan is to have it work with other devices besides the DS, like a laptop, PDA, or any other Windows CE or Linux devices. This device is new, and it is so new that I don’t have any price or availability for this product. The fact that Ranger China is making this hopefully does not mean it has an Asian release. Of course, one would have to ask oneself why have a GPS for the DS? After all, it is a gaming device, and only kids are probably going to use it. Do they need a GPS? 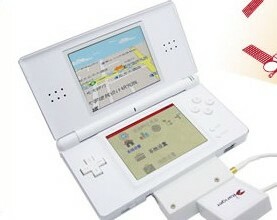 Perhaps someone is hard at work at turning the Nintendo DS into an all-in-one device for our young people. However, isn’t that what a cellular phone is doing already? If its an adults multifunction gaming platform you want then look no further than PSP. If you take the trouble to install custom firmware then you can put all kinds of useful things on there (they have at least 3 GPS units already out for PSP). My PSP is not only my handheld gaming device but it is my GPS, PDA, and my IP phone as well. It’s cool that Nintendo is stepping up to the plate by adding GPS capabilities, but c’mon! With smart phone devices now abundant, does anyone really use these portable gaming devices(like the DS, PSP, Playstation phone etc)? I’m an Apple fanboy myself and my iPhone has tons of games and decent graphics. Plus it does everything gaming devices can’t. I’ve never really felt that I needed an entirely separate device to improve my gaming experience. Honestly, I’m surprised that portable gaming devices haven’t died yet.